UNO Open Access Stations provide personnel, animal and environmental protection while offering utmost efficiency for cage changing operations. Open access on two sides provides ample work space for one or two operators to transfer animals from dirty cages to clean ones. 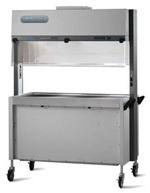 For maximum productivity, the mobile station may be transported down aisles between cage racks while an operator works from eachside.